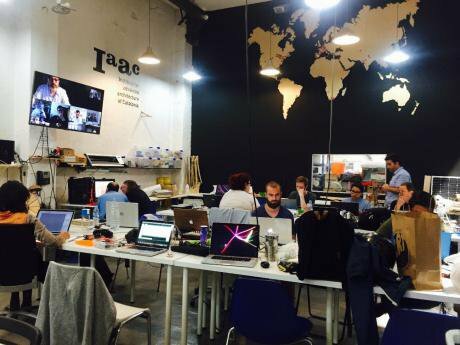 Fab Lab Barcelona at the Institute for Advanced Architecture of Catalonia (IAAC). On the screen, artist and designer Olafur Eliasson gives a lecture to the fab lab network within the Academy’s program. Hundreds of years ago, human agriculture made excess production possible, and this led to the accumulation of goods, the concentration of people in towns, and the end of the role of the hunter-gatherer. A few hundred years later, we came up with a system to organise the exchange of services and products at an abstract level: money. Today’s economy is based on the flow of real and fictitious money, which simplifies the value of assets, skills, people, resources, and almost every element of reality. Money has become a means and an end in itself. The Maker District has been conceived as a collaborative and co-created process aiming at building, with the local community and a global network, the Fab City project’s vision, and creating an experimentation playground to design, make, test and iterate new forms of governance, trade and production at the local (neighbourhood) level, using advanced technologies to accelerate the process of making cities more resilient and inclusive. 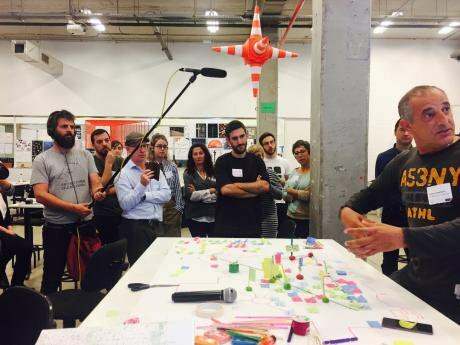 At the city scale, Fab Lab Barcelona is leading the development of the Fab Labs public network: it advises the city council on building the first infrastructure layer for the Fab City, as described in the project’s white paper. The newly named Ateneus de Fabricació will then have to choose between two operation models: a) being bureaucratised by the City Council machine, or b) becoming an avant-garde force for innovation in public policy matters. This is, for now, still an open question.